In many ways, on both the new- and used-vehicle side of the automotive market, 2019 is starting much like 2018 did. The economy, for the most part, is humming along, and sales of cars and trucks have been solid. But like last year, analysts warn that what has gone up since the Great Recession must surely come down — at least a little. The tepid outlook reflects macroeconomic concerns, such as the government shutdown, rising interest rates and the threat of tariffs — in addition to record-high vehicle prices. "This year is starting to be quite interesting because there's a cloud of uncertainty as we start out" 2019, said Anil Goyal, executive vice president of operations at Black Book. New-vehicle sales are widely expected to drop below 17 million after topping 17.3 million in 2018, while used-vehicle sales are expected to be fairly flat. "We estimate the market to be around 39 and a half million on the used side in total," said Charlie Chesbrough, senior economist at Cox Automotive. Cox has estimated that used-vehicle sales edged up 1 percent in 2018 to 39.6 million vehicles. Edmunds, too, is forecasting flat used-car and used-truck sales, potentially ending a five-year streak of gains since the market tallied 35.7 million transactions in 2013. According to Edmunds' estimates, used-vehicle sales grew 3.1 percent to 40.4 million units last year. Senior analyst Jeremy Acevedo said he's expecting some of the slowdown on the new side to benefit used. 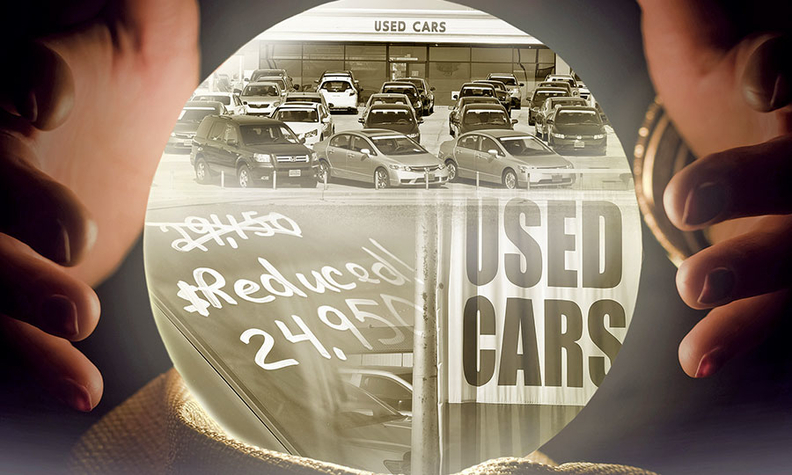 "We do think it's going to be another strong year for used cars in 2019," Acevedo said. However, that still translates to flat sales vs. 2018. With new-vehicle affordability continuing to challenge many consumers, more of them may turn to the used-vehicle market. "The fundamentals remain solid; used-vehicle demand is at a peak," Jonathan Smoke, chief economist at Cox Automotive, said in a conference call for the Manheim Used Vehicle Value Index. "Wholesale supply is now post-peak and starting a gradual decline." Tax reform generally helped consumers keep more of their income, and that helped spur both new and used demand last year. The effect on 2019, however, is in question: Smoke has warned that insufficient withholdings may leave many filers unpleasantly surprised by lower returns. "At this point this is a major concern for the first quarter and could have economic implications for the rest of the year," Smoke said. Still, Smoke noted, "the used market is the answer for the affordability challenges in the new market." With about 300,000 more vehicles coming off lease in 2019 vs. last year, Cox expects lease maturities to peak at 4.1 million units — three years after new light-vehicle sales set the record of 17.6 million. While this should push prices down, some of the inventory is being absorbed upstream, said Tom Kontos, executive vice president and chief economist at ADESA Analytical Services. Kontos said that on the wholesale side, his company saw a high percentage of off-lease vehicles being purchased by the originating dealer or a franchisee of that captive's brand in 2018. "So with a high percentage of purchases happening upstream, there were comparatively fewer vehicles working their way downstream into physical auctions," Kontos said. That distribution of volume helped keep prices from falling fast. Whether that continues in 2019 is a key question. Also, with an expected increase in supply, a higher depreciation rate is forecast for the year, Goyal said. Black Book registered an overall depreciation rate of 12.4 percent at the end of 2018, which is less than the 13.6 percent average over the last five years. The group is forecasting the depreciation rate to swing to a relatively high 15 percent this year, he said. Three years after light-truck sales first topped 60 percent of the new-vehicle market, analysts expect more SUVs and crossovers to arrive on the used-supply side, which could lead to downward price pressure on those segments. "Even if supply growth in total is fairly moderate, the growth in crossovers and SUVs is going to be fairly significant," Kontos said, calling it a "natural result" of years of growth in their total sales vs. that of cars. Heretofore, a relative lack of supply in the SUV and crossover segments has driven up prices. "But we've also seen that just having more supply doesn't mean the used-vehicle value goes down," Goyal said. "Demand is a big piece of it." Black Book expects more consumers to be cautious with finances in 2019 because of uncertainty and the potential for a slowdown in the economy's growth rate. "So we do expect that demand for compact and subcompact cars will continue," Goyal said. Chesbrough, of Cox, noted that the Great Recession led to a dearth of model-year '10 vehicles on the used market. "Because we only sold 10.4 million in 2009, well, that means there's nothing to sell, or very little inventory available," Chesbrough said. The trough year still affects the used-vehicle market, he added. "So you still have a lot of that 10-year-old supply that isn't available, and it's forcing many independent dealers to come to the market and come to the auctions, and [they're] buying newer product than they might normally be selling," he said. That's pushing prices up in those newer model-year vehicles. Acevedo, of Edmunds, said that in the 8-year-old-plus vehicle segment, "anything just flies off the lot."